They are the last survivors of their race, beings who live on and communicate through energy, who are capable of assuming the shape of any other species. When their youngest member is assigned to a world considered safe to explore, she is captured by the natives. To escape, she must violate the most important rule of her kind, and reveal the existence of her species to a fellow prisoner - a human being. Now her race is in danger of extinction, for even if the human does not betray her, the Enemy who has long searched for her people may finally discover their location. ©1998 Julie E. Czerneda (P)2012 Audible, Inc. 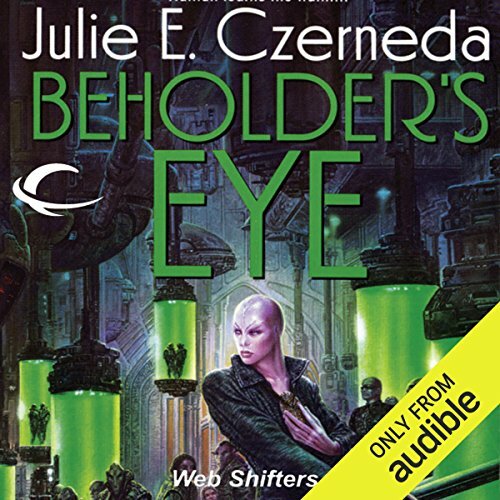 I was thrilled beyond words to find books by Julie Czerneda finally available on Audible. I chose Beholder's Eye because I had not read any of the Esen books yet. The story everything I expect from the talented Czerneda, with fascinating characters and settings, and sly bits of humor when you least expect it. I will have to buy the book as well now; it was just that good. The narration was equal to the story. Luci Christian Bell did a wonderful job keeping the characters separate, even Esen in her many forms sounding different, but still Esen! I highly recommend this audiobook. Just don't try to listen to it and work, because you won't get much work done! Would you consider the audio edition of Beholder's Eye to be better than the print version? The audio version is great for sharing with the whole family. We tried to recommend the book to my sons, but they never bothered to try it. When we popped it in on a family road trip, that's when they finally understood. We are all looking forward to the next opportunity for family listening so we can continue the saga. The book is also good, though. My copy is a well worn friend. What other book might you compare Beholder's Eye to and why? Incomparable. But, it's a good fantasy story, for people with plenty of imagination. The intellect and morals embraced by the main character sit very well with me. The twists and turns are clever and often surprising. Have you listened to any of Luci Christian Bell’s other performances before? How does this one compare? Have not heard any others from Ms. Bell. That would be a spoiler, but yes, there are more than one. Esen-alit-Quar is one whose personal values and moral choices are unwavering in the face of many difficult moments. This story deserves to be on all the recommended reading lists. A classic, sitting proudly beside the greatest masterpieces. Oh these girls can really do outstanding sci-fi! I'm a very sexist being, and while I reckon that women can write excellent romances, complex plots and even space operas (e.g., Lois McMaster Bujold's Vorkosigan saga), till this day I have always dreaded the lack of "technical enthusiasm" that goes with the girls, and specially, the girls which are capable writers. Without the what-if of a scientific or technological issue, a sci-fi book is a table lacking three legs. So I was very apprehensive when I got this book, and my apprehension went all the way to dismay when I perceived that the reader was also a girl with a voice tone better suited for a reading of "Romeo and Juliet". I was wrong. Luci Christian Bell, the reading voice, is extremely capable, and in this book she matched the multiple species and personalities covered by the story and the protagonist very well, sounding at times polite and refined, wild and hoarse, smart, dumb, or outright cow-ish, depending in the story's moment. The story itself is nicely deep and contained, with enough of what I was looking for. For example, the author explores the interesting sci-fi question of "what would happen if I could remember things as being you". Furthermore, she mixes-in core humanistic issues, like sentience, xeno-engagement, and how do we assess things or people to feel us part of them or to reject them. All of that complemented with a diverse but sharp assortment of characters, that thanks to the skills of the author and the voice we can frequently enjoy as first-person, each time with a unique species-perspective. The book has some minor flaws, but then I think that a solution for those would have been worse than the flaws themselves. For example, a deeper story would have required a longer and less fun book, thus reducing the amount of joy per page. So, all in all, I have truly enjoyed this book and think is on pair or better than many I have read from very good male sci-fi authors. I dearly recommend it! 3 sur 7 personne(s) ont trouvé cet avis utile. This is the second Czerneda novel I've read, the first being a Thousand Words for Stranger. Having said that I can't see myself ever picking up the rest of either of their respective series. Czerneda has an absolutely fantastic imagination, the worlds she creates are most impressive. The problem is I can't stand the characters she places in them. She has some of the most absolutely one sided characters I have ever read about. Her villains are the absolute worst of the bunch. Having a 'bad' villain really just kills the entire story for me. It surprises me to no end how she has consistently let me down and how I kept reading on despite this. This will be the last book of her's I will read. Luci Christian Bell was an excellent narrator and I wouldn't hesitate listening to her again.